Nature Trail walks - Take a casual stroll around The Bungalow or for the more adventurous a hike through the rubber estates, crossing streams, climbing rocks overlooking breathtaking views. From some points you can even see the twin towers of Colombo, Adam's Peak or the sea! Take part in the estate - we can organise for you to spend a morning with the tea pluckers as they identify the best leaves in the bush! OR an afternoon with the rubber tappers who expertly carve the barks of rubber trees with special chiseled knives, and collect rubber milk in coconut shells! For the break - have breakfast or lunch with the workers sitting under a rock in a shade of a coconut tree eating your meal out of freshly cut banana leaf plates! Visit a rubber or tea factory - There is a functioning rubber and tea factory only 2 miles away from The Bungalow where you can see how tea is dried and packages or how rubber milk turns into elastic sheets! We can organise for a visit to these factory when you are staying with us! Have a meal with the locals - we can organise a meal for you with the villagers. They will welcome you into their homes, where you can watch while they cook Sri Lankan treats. Have locally made Arrack (coconut rum) or Ra (toddy). Learn to cook Sri Lankan food - our chef in the bungalow will be thrilled to teach you how to make simple tasty Sri Lankan food, which you can then try at home to refresh your memories of your stay. From cutlets, lentil curry to hoppers... there's a favourite for everyone! Bentota - 30 minutes' drive from The Bungalow. Being one of the most established beach resorts in Sri Lanka, Bentota is known for its professional touristic infrastructure. Safe swimming conditions combined with fun water sport in the lagoon and exciting excursions such as boat rides and diving, Bentota is an ideal day-out from Pantiya Bungalow. At Club Intersport, one can enjoy water sports from jet skiing to banana boat rides and several other exhilarating sports. 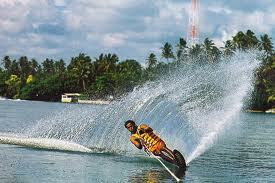 Full and half day excursions can be organised from Pantiya Bungalow to Aida Ayurveda & Holistic Health Resort. Ayurveda, an ancient Indian philosophy of health and wellbeing, a holistic system which guides one so that one can live a healthier and more balanced lifestyle through food, lifestyle, massage, yoga and herbal remedies to suit ones individual make-up. 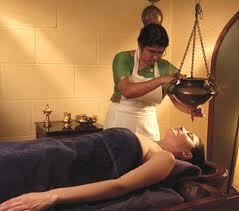 NEW Ayurveda body massages and steam chest is available now at The Bungalow! 30 minutes drive from The Bungalow. The late Geoffrey Bawa's world famous home which is now open to the public is about a 40 minute drive from Pantiya Bungalow. Lunuganga is a remarkable experience, where one can marvel at this renowned architect's wisdom and simple expressions of good taste and style. 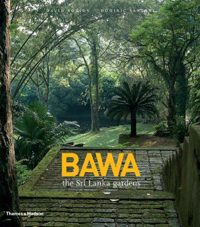 The Brief is the garden of landscape, architect Bevis Bawa, yet another remarkable artist of the last century developed since 1929. It is a hillside garden with excellent views and many sculptures - both by Bevis himself and other artists. The estate was formerly a rubber plantation. 40 minutes drive from The Bungalow. Pahiyangala is a very large cave on top of a hill in Yatagampitiya, which is about a 40 minute drive from The bungalow. Excavation has proved that these caves were inhabited by prehistoric cave men some 37,000 years ago and is one of the places where remains of the pre-historic 'Balangoda Man' have been found. This cave is supposed to be the largest natural rock in Asia and this is also known to be the most ancient pre-historic human settlement in Asia. There is a mini museum with artifacts & skeletons dug from the location. One can observe excellent views across the low plains from the cave. The waterfall which is about 33 feet (10 metres) high flows down over an almost vertical, hard rock bed about 40 feet (12 m) in breadth. 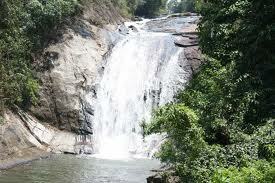 It is a wayside fall located very close to the Kukule Ganga, hydro-electricity project which generates 70 Mega Watts per day, in the Kalutara district.The Makeli Dola, a stream rising in Kalawana as a branch stream of Kukule Ganga, after flowing through villages and mountains, eventually joins the Kukule Ganga once again at Makeliya forming the Makeli Falls. The waters of Kukule Ganga hydro-electricity project, Kulule Ganga and Makeli Dola join at the same point and flow further to join Kalu Ganga which flows into the Indian Ocean at Kalutara. 1 hour drive from The Bungalow. Only 32kms from Panthiya Estate, Madu Ganga -the beautiful river consists of 23 islands including two main islands providing shelter to 215 families. 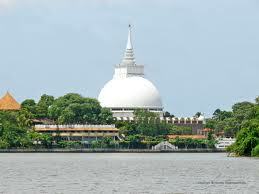 Madu Ganga is possibly one of the last remaining tracts of pristine mangrove forests in Sri Lanka. The inhabitants of its islets produce peeled cinnamon and cinnamon oil. 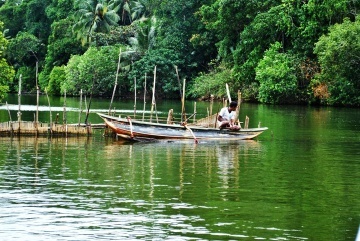 Local and foreign tourists can explore the beauty of Madu Ganga through a boat ride that takes a couple of hours. 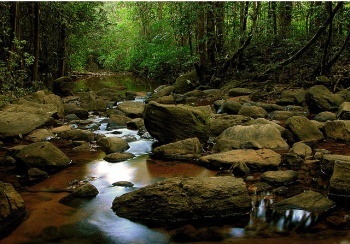 Sinharaja Forest Reserve is a national park and a biodiversity hotspot in Sri Lanka. Sinharaja is only 26km's from The Bungalow. 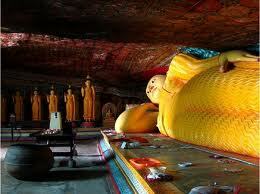 It is of international significance and has been designated a Biosphere Reserve and World Heritage Site by UNESCO. The hilly virgin rainforest was designated a World Biosphere Reserve in 1978 and a World Heritage Site in 1988. The reserve's name translates as Kingdom of the Lion. It is a treasure trove of endemic species, including trees, insects, amphibians, reptiles, birds and mammals. Of Sri Lanka's 26 endemic birds, the 20 rainforest species all occur here, including the elusive Red-faced Malkoha, Green-billed Coucal and Sri Lanka Blue Magpie.